Above: The Tom Ford Summer 2014 Collection is packaged in the original white and gold motif...simply gorgeous. The hotly anticipated LE Tom Ford Summer 2014 Collection debuted a few days ago; housed in the original white and gold packaging, this lovely beauty edit embraces stunningly chic, luminous washes of color. 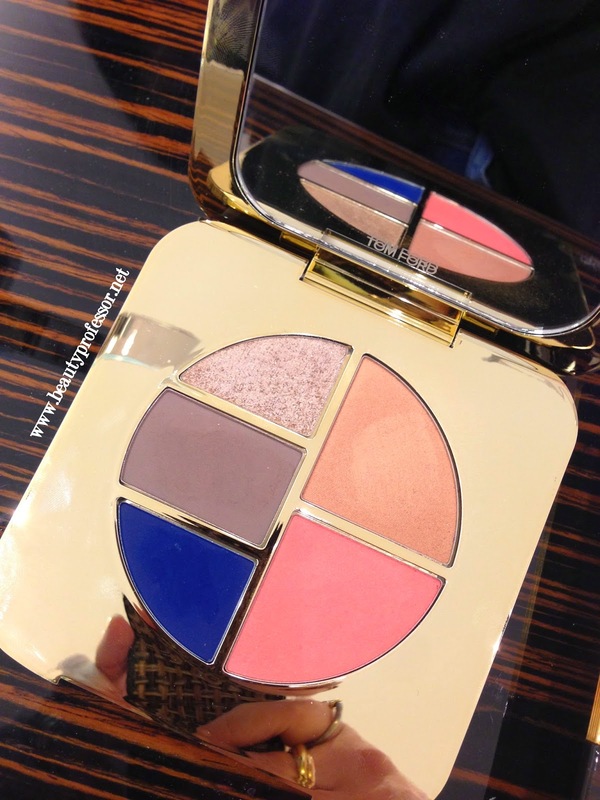 Above: The Unabashed Eye and Cheek Compact features three eyeshadows (champagne, taupe and teal-meets-royal blue), a peachy-pink blush and a glowing light bronze highlighter. Although I made sure to swatch the buzz worthy Unabashed Eye and Cheek Compact (currently found at Neiman Marcus, Saks Fifth Avenue and Selfridges), I knew that it wasn't going to be a viable purchase for me personally. I tend shy away from palettes because I often find myself underutilizing certain shades, making the compact in its entirety a questionable investment overall. That being said, the swatches below reveal its inherent beauty...I love the shimmering champagne and taupe eyeshadows and would have bought of duo of these shades alone on the spot should it have been available! 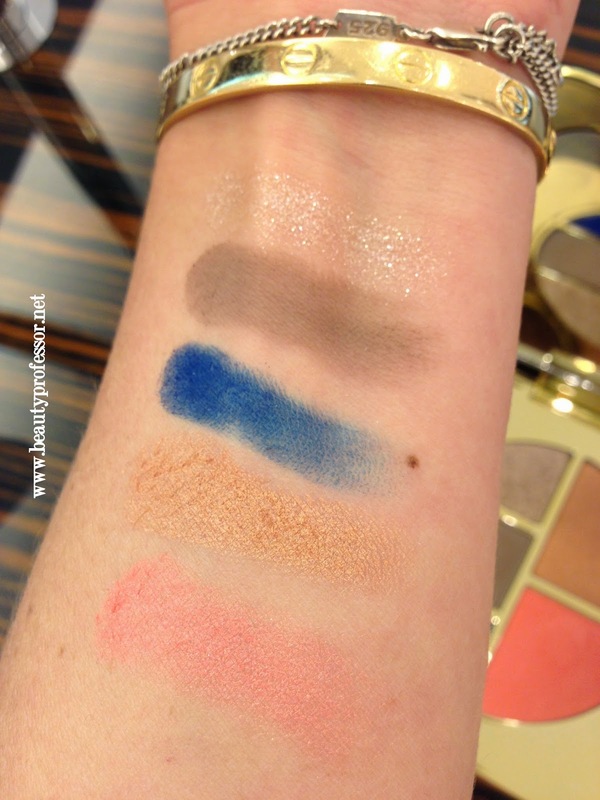 Above: Swatches of Unabashed in indoor lighting. Above: Swatches of Unabashed in direct sunlight. Above: The Tom Ford Lip Shimmers retail for $49. I was, however, captivated by the Lip Shimmers in Moonlight and Solar Gold (available at Neiman Marcus, Nordstrom, Saks Fifth Avenue and Selfridges). Designed to add a dazzling glow to the lips (though I'll be using shades as highlighters for the face as well), the vanilla-scented formula offers shiny coverage that is sheer yet creamy and decidedly moisturizing. Such a brilliant incarnation. Tom Ford's Summer collection focuses on effortless beauty with a palette of sun-kissed neutrals and a few daring brights sprinkled in. The Lip Color Sheer brings a decadent mix of vitamins C and E, plus shea butter, to your lips to hydrate and moisturize while delivering the perfect color. The distinct lip color is packaged in a limited-edition ivory- and gold-colored case. Above and below...the full ingredients for the Tom Ford Summer 2014 Lip Shimmers. Above: Moonlight and Solar Glow...works of art, indeed. Above: Moonlight is a luminescent, colorless, slightly warm (rather than cool blue) pearl white...it reminds me of a shimmer from the 1960's that my mom kept for years made by a company called Yardly. Above: A closeup of Moonlight. Above: Solar Gold is a slightly bronzed light gold with warm shimmer. Above: A closeup of Solar Gold. Above: Swatches of the Tom Ford Lip Shimmers in direct sunlight. 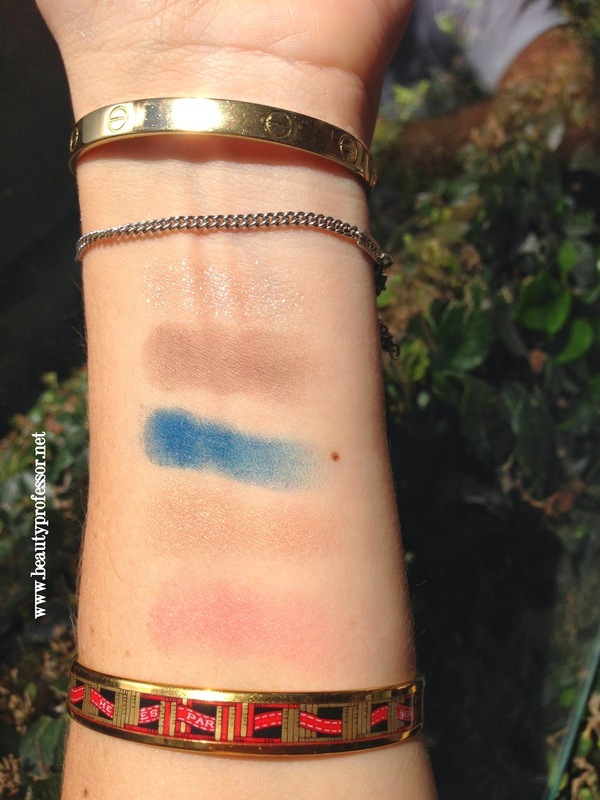 Above: Swatches of the Tom Ford Lip Shimmers in outdoor lighting with a flash. Above and below...wearing Moonlight Lip Shimmer as a base on the lips with a touch of Armour Beauty Opaque Gloss in Hello (reviewed HERE) for a slight flush. I also added a bit along my cheek and brow bones for subtle illumination. Bottom Line: I am very pleased with the Tom Ford Summer Collection Lip Shimmers. They are moisturizing and have great lasting power, while imparting the most delicate, flattering soft gleam. I love wearing them alone (both on the lips and the face as a highlighter) as well as mixed with a deeper lip color. I cannot wait to experiment with these further...the possibilities are endless! The Moonlight and Solar Gold Lip Shimmers are available at Neiman Marcus, Nordstrom, Saks Fifth Avenue and Selfridges...if you are partial to a sophisticated shimmer, I recommend that you procure one or both before they sell out! Gorgeous purchases! Both Solar Gold and Moonlight is stunning! The Solar Gold and Moonlight lip shimmer are especially beautiful, especially the way youve mixed/applied them! Gorgeous and wonderful, as always! I actually went the other way and only got the palette. In fact, when it arrived and I saw how gorgeous it was, I ordered a backup immediately!! I'm not a back-up girl at all, but something about this palette just speaks to me, and quite literally took my breath away. On me, these colors are year-round, so that was my other motivator. As usual, your fabulous review has me wanting more!! Those lip shimmers are so very tempting!! Do let us know how the experiments with Solar Gold go. If it can be used as face highlighter as well, I'm totally sold. I am glad you love the palette, Lisa...it is truly lovely and the fact that you plan to wear it year round makes it backup worthy, indeed! I am waiting for my palette to arrive, cannot wait! What foundation you have here, you look flawless!! Fantastic...hope it arrives for your soon, Virginie! I am wearing the Cle de Peau Cream Foundation in O20 in these pictures...thanks for your sweet words! It actually arrived today, right after I commented :-D. Any primer??? Any miracle potion, I really like the aspect of your skin here....Gorgeous! Marvelous!! Enjoy it, Virginie. I am wearing the Le Metier de Beaute Peau Vierge as a primer and then the Cle de Peau foundation (will be doing a full review with swatches of every shade very soon!) buffed on with a Beauty Blender. So far I'm loving the formula. Thanks again for your compliment!